Ministry of Propaganda - 11/Sep/2006: "Reducing Clutter Causes Nostalgia"
Apart from working on finding a new job (busy on preparing/ updating the CV this week) I'm also trying to reduce the clutter in my home. Partly because I feel too much stuff I don't really need has accumulated over the years, partly because I hope/ assume that I will move house for a new job and want to reduce the amount I'll have to move. On Saturday I had a first stab at my CD collection, which I estimate contained somewhere between 300 and 400 CDs (incl CD singles). After a few hours of work I purged 64 CDs, which I'm now trying to flog on eBay: 64 assorted Britpop/Rock/Pop CDs, mainly compilations. I hope someone is going to buy them, £10 (well, that's the starting bid) sounds quite reasonable to me. That's less than 16 pence per CD! 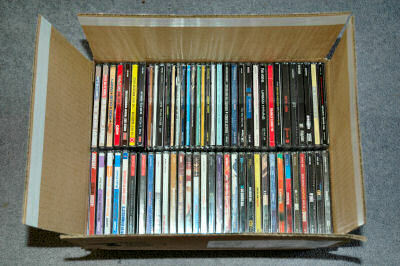 OK, the postage is another £10 (almost, £9.97 to be precise), but then the whole box with the 64 CDs weighs almost 7kg. Any takers? And what does this have to do with nostalgia, I hear you ask? Well, quite a few of the CDs I looked through (and several of the ones which went into the big box) were from the mid to late 90s, when I first moved to the UK. The time of Britpop. One of the CDs I came over was All Change by Cast, anyone remember them? If not try the Wikipedia entry for Cast to refresh your memory. I remember going to two concerts to see them play, I think one was in Gloucester, the other one in Reading. Must have been late 1996 or early 1997. Those were the days. Oh, and I kept this CD, still quite like it. Reminds me of my first years in the UK, everything was still new and exciting. My first right hand drive car and my first (and so far last) police traffic check on the way back from Gloucester (have you drunk any alcohol, sir? I hadn't). Long and hot summers. Those kind of things. Which CDs would you keep if you were to clean up your collection and what do they remind you of?